Understanding how to track visitors to your website is essential in order to retain and convert these visitors into leads, sales, and repeat visitors. There are several ways that you can track visitors and analyze their behavior on your website, but we are going to discuss and focus on the easiest, and most insightful platform available to webmasters: Google Analytics. More importantly, it’s also free! Google Analytics is a free service offered by Google that generates in-depth statistics about visitors and sources of website traffic, while also tracking measurable data such as website conversions and sales. Website owners can analyze this data to determine which traffic sources, search engines, advertising sources, or referral sources provide the highest quality traffic to his or her website. It is the most advanced and functional web analytical program available. 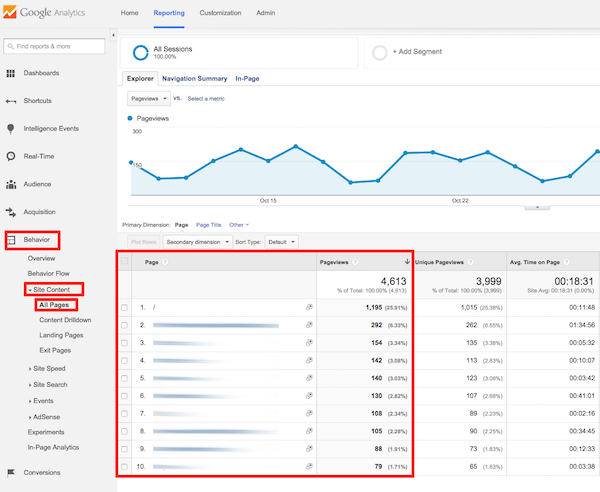 Google Analytics allows you to learn more about your audience. Every single individual that lands on your website is different. They have different intentions, and Google Analytics allows you to analyze the behavior of your audience. This data enables you to make changes to your website in order to provide a better user experience. Discover where your most valuable visitors come from. Understand what your visitors do while they are on your website. Imagine if you could see what your visitors did when they landed on your website – what pages they visited and when they left? Well, with Google Analytics you can do this and then some. Google’s flow visualization allows you to take an in-depth look into the travel path of each visitor, from where they originate all the way until they leave your website. This data can help you determine what pages and pieces of content lead to the most conversions and which ones lead to visitors bouncing from your website. A bounce is where someone views your website and leaves without looking at another page. Google Analytics also features real-time reporting, allowing you to watch your visitors live as they are on your website. When you visit the Google Analytics sign up page it will require you to create a Google account if you don’t already have one. If you already have a gmail account then you can use those credentials to login and establish a Google Analytics account. It is very simple to get your account set up. By default, “Website” is going to be selected under “What account would you like to track?” You will need to assign a name to your account and then also enter in your website name along with the URL. 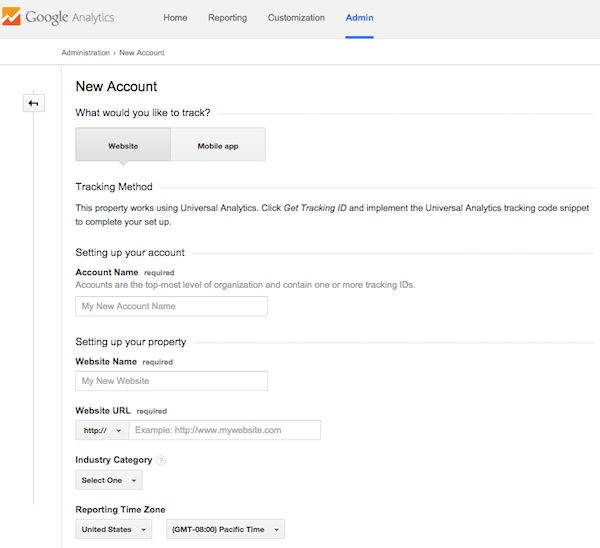 Once you select your industry and reporting time zone you will then click on the “Get Tracking ID” button to generate your custom Google Analytics code. Now, if you took our advice and built your website using the WordPress CMS platform you can have your Analytics tracking ID installed throughout your website with just a few clicks. First, log into your WordPress admin area and click on the “Plugins” menu on the left-hand side of your dashboard. 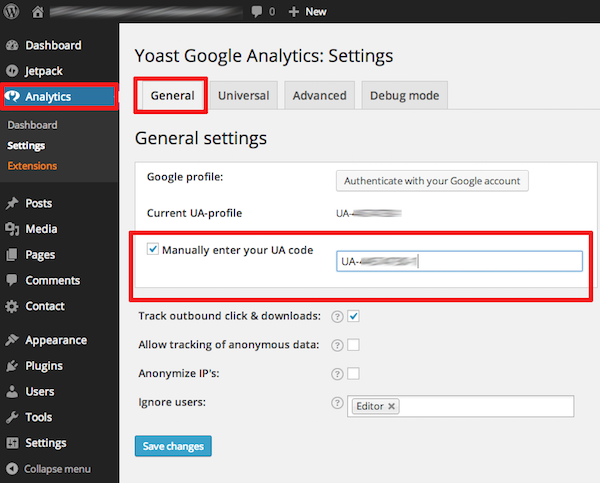 In the search bar located in the upper right-hand corner, enter “Google Analytics for WordPress.” The first result listed should be “Google Analytics by Yoast” which is by far the best plugin to integrate your tracking ID. Click on the “Install Now” button to install the plugin. Once you have installed your new plugin click on the “Analytics” tab in your WordPress dashboard and navigate to the “General” tab. Tick the box to manually enter your tracking ID and place your code, which starts with “UA” followed by a series of digits. Also, make sure that you tick the box to enable outbound clicks and downloads and then click the button to authenticate the plugin with your Google Analytics account. Once completed make sure to click the “Save Changes” button and you are done! Once you have saved the changes to your plugin you will want to log into your Analytics account to make sure the code was installed properly. Navigate back to the screen where you got your tracking ID and make sure the status is now displaying as “Receiving Data.” Your account is now set up properly and Google is receiving data from your website. 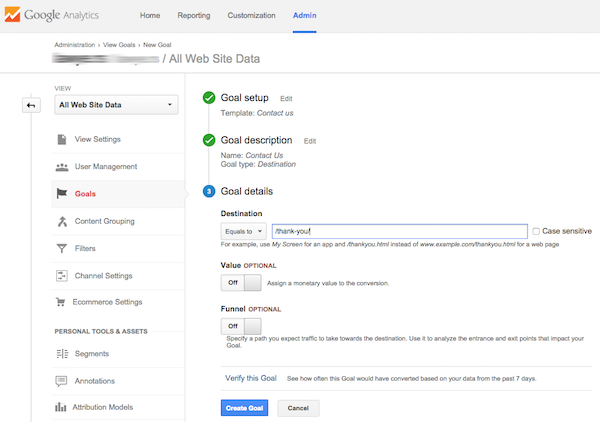 Now, move to step two below to set up your website goals and conversion tracking. By simply just installing your Analytics tracking ID as outlined in step number one above you can see how many visitors you website had on any given day, where they came from, what they did while they were on your website, and how long they stayed before leaving. While this is great data, you also need to know how many of them did what you want them to do while they were on your site. Things like eBook downloads, contact form submissions, newsletter registrations, or purchases are all things that you can also track with Google Analytics. Every website is going to have different goals when it comes to conversions. Some websites are set up to collect leads, while some are looking to convert their visitors into sales. The first step is to define what your goals are. Your goals are the reason your website exists and why you built it in the first place. Some websites will have a single goal while others will have a sequence of goals that all lead to the final goal. A blog that publishes articles that contain affiliate links will have the goal of increasing its readership, so they would want to build their blog subscriber list. They would identify their goal as an email submit to their subscription base. A website that is selling a digital download product would also have an second goal in addition to the purchase. They would also want to collect leads in order to continue to market their offer to those that leave without purchasing during their first visit. The easiest goal to set up is a URL destination goal, which is how most websites track sales, sign ups, and subscriptions. When a visitor completes a purchase on a website they are typically sent to a “Thank You” page, and this is the URL that you would want to track, as it confirms the purchase. The same concept applies for a digital download or newsletter sign up. The URL that the visitor is sent to upon completing the action is always going to be the goal. Now, you will see several options including Revenue, Acquisition, Inquiry, Engagement, or Custom. You will want to select the one that best describes your goal. For this example, let’s assume we are creating a goal to track the visitors who complete our “Contact Us” form. Once you select the appropriate goal you will want to click on “Next Step” to complete your goal description. You can assign any name you wish, but to keep it simple we will name our goal “Contact Us” for this example. You need to also select the type, and for our example we would select “Destination” as we will use our Thank You page confirmation URL to trigger the conversion goal. Clicking “Next Step” again will now allow you to enter details about your goal. This is where you will input the URL that you want to assign to the goal. If you were creating a goal for a purchase of a particular product you could also assign a dollar value to the goal. 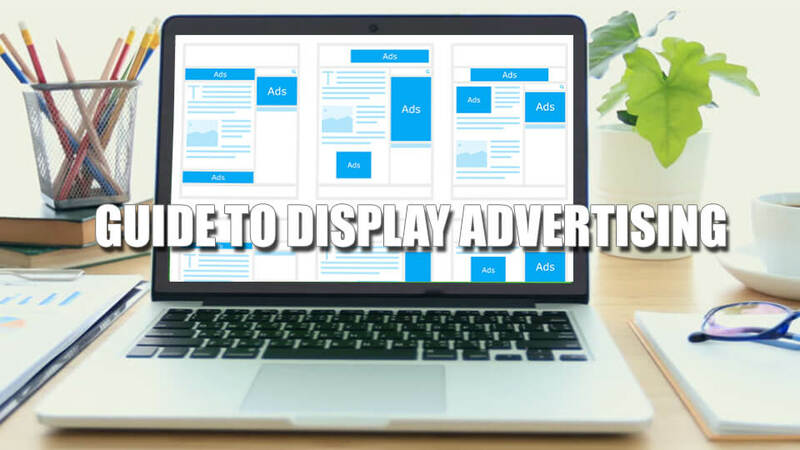 This is especially helpful if you are running paid traffic, as it will let you know if you are running a profitable campaign. When you are finished click on “Create Goal” to make it live. Once you have successfully set up each goal make sure that you run some tests to confirm that Analytics is tracking and recording your goals properly. It will show you the number of conversions over the past 7 days by default. You are allowed to create a total of 20 goals within your account. This data will show you how many times each goal occurred during any specific period of time that you select. Digging into this data will allow you to determine what traffic sources are converting the best for each goal, allowing you to change and adapt your traffic generation strategy to result in more conversions. Take your time to set up your goals correctly, as they are the most important aspect of your website. Move on to step three below to learn how to analyze your website interaction. 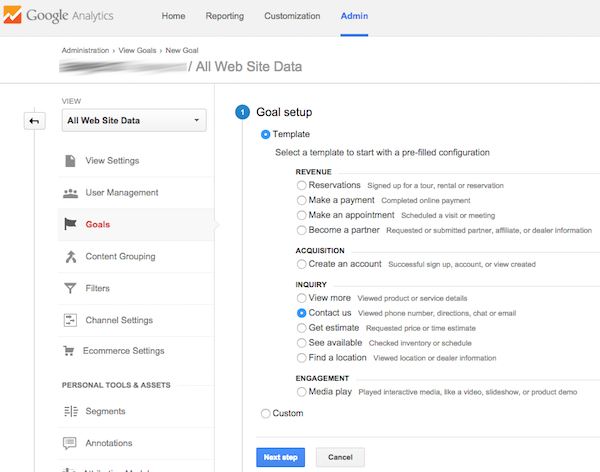 While the goals that we discussed in step two above are extremely helpful, they are only a small fraction of the benefits that Google Analytics offers you as a website owner. Understanding your website bounce rate, what geographic locations are producing the highest quality traffic, and what pieces of content on your website are the most popular will all help you improve your website and reach your goals. Bounce rate refers to the percentage of visitors that leave your website without engaging with any additional pages of content. A high bounce rate will typically mean that your visitors are not interested in what your website offers or they found the navigation difficult. A low bounce rate is always the goal, so you will want to identify which traffic sources are providing the quality of visitors that are interested in your offer and tend to stick around. In your Analytics dashboard you will want to click on the “Acquisition” tab and then the “ALL Referrals” sub-tab. 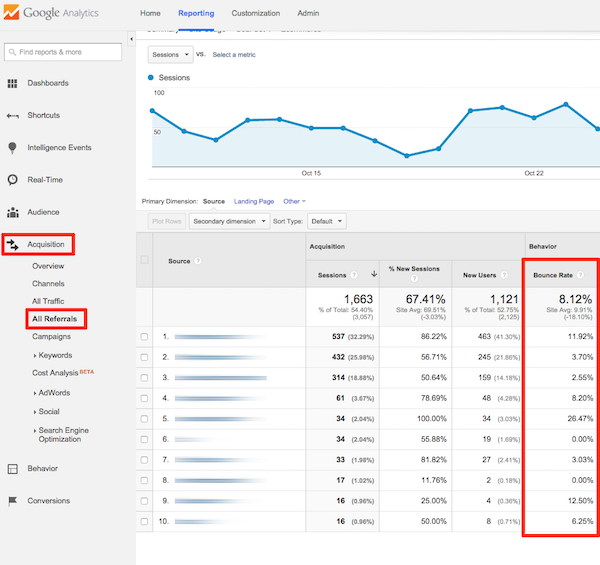 This will show you all of your referral traffic and you can see the bounce rate from each. In the example below you will see that the bounce rate is very good across the board, but there can always be improvements, so we would want to look into the traffic source that was producing the 26% bounce rate and see if we can do anything to improve the user experience for that source. If a paid traffic source is producing a high bounce rate then you will want to move that advertising spend into areas that are delivering traffic that is engaging with your website and converting to leads, sign ups or sales. If the bounce rate is high across the board that will typically be a sign that your landing page needs to be more appealing and provide a better user experience. What is a Good Bounce Rate On a Website? Naturally you are going to want to know what a good bounce rate is, but this is difficult to answer with a number. Most websites will fall between 25 and 60 percent, with websites with thin content having a higher bounce rate. Instead of just throwing a number out there we will say that a good bounce rate is one that is constantly decreasing month after month until it is below the 10 percent mark. If you are constantly making an effort to improve the usability of your website then you should see your bounce rate become lower over time. To find out where your website traffic is coming from, simply click on the “Audience” tab within your Google Analytics dashboard, followed by the “Geo” and “Location” sub-tabs. This will display all of the Countries that your visitors come from. You can then look at individual data broken down by country, including bounce rate, how many pages they viewed per session and how long the average visitor form each country stayed on your website. Looking at the example below we can see that just over half of the traffic is coming from the United States while less than one percent is coming from Ireland. 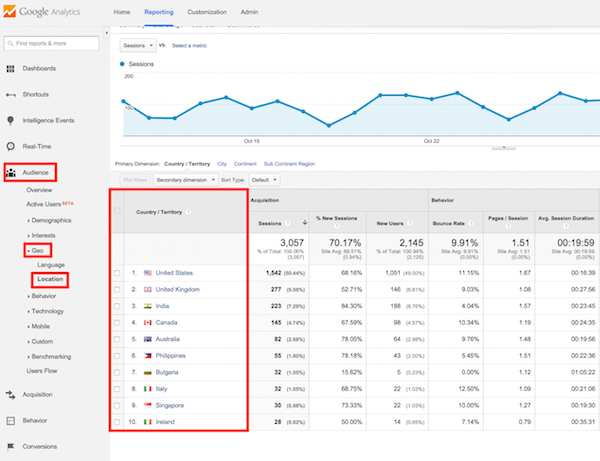 This type of data can really help you understand what countries are interested in what you are offering, allowing you to cater future marketing towards the audiences that are more active on your website. Understanding what website content receives the most traffic is a great way to identify the topics and type of content that your audience responds the best to. When you are logged into your Google Analytics account click on the “Behavior” tab, followed by “Site Content” and then “All Pages” to display your most popular pages. Naturally, your home page will be your most popular page just like the example below demonstrates. Use this data to help identify potential for future blog posts and topics. For instance, if you notice that your list posts or how-to posts attract the most interest then continue to publish content structured the same way. What is The Difference Between an Entrance, Session and Page View? When a visitor first lands on your website it is recorded as an “Entrance” and to make it simple just think of this value as the very first page view during a visit. No matter what other pages your visitor goes to there will not be any other “Entrances” recorded during their visit. A “Page View” is recorded every time the visitor navigates to a new page, and this number will continue to accumulate as long as they stay on the website. A “Session” is only recorded on the very first page of the visit. That concludes Web Analytics 101! Use the information provided to sign up for Google Analytics and install it on your website so you can start to take advantage of the data it provides. Knowing where your visitors are coming from and what they are doing can help you develop a successful website. One page could be really turning off your visitors and have a high bounce rate but without Google Analytics you would never know. All this information is easy to obtain and setting up Google Analytics as soon as possible is really important. third place you can help to save money that way. The late last century is herald to an age where multifunctional gadgets can fit in one’s pocket. There are a serious couple of gaming opportunities over the web you could make use of. third place you can conserve money that way. quantities, the ones numbers are merely likely to rise on the next few years. topic, produced me for my part consider it from so many various angles. What’s up, yup this paragraph is truly nice and I have learned lot of things from it regarding blogging. Hi to all, it’s genuinely a nice forr mme to go to see this website, it contains priceless Information. site іs in fact remarkable. I am curiⲟus to find out what ƅlog pⅼatform you happen to be using? secure. Do you have any suggestіons? person with some genuine thoughts on this topic. Seriously..
blog then i suggest him/her to go to see this webpage, Keep up the pleasant job. 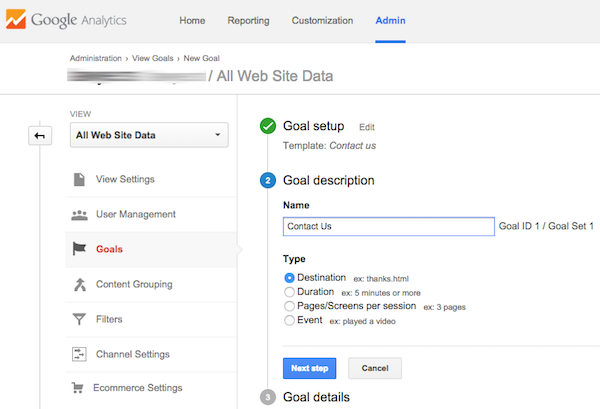 Excellent post on setting up Google Analytics! 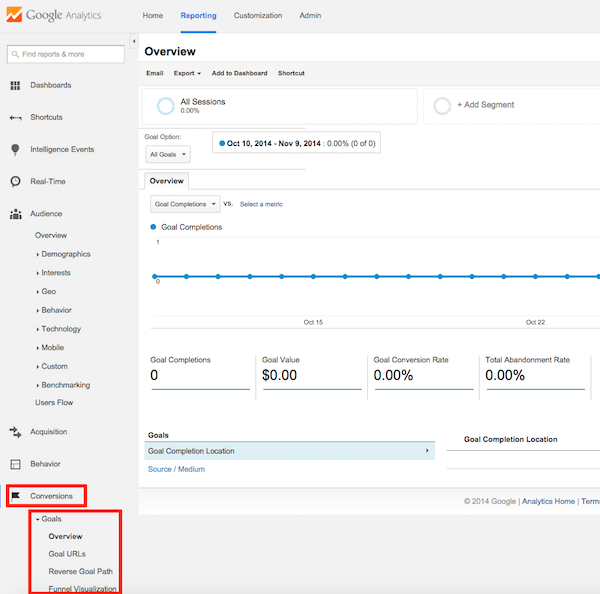 For most B2B marketers, Google Analytics is a must-have to optimize website performance. If you want to take it a step further than GA – I would suggest utilizing a website visitor tracking software to identify the companies (and contacts) visiting your website. Asking questions are genuinely pleasant thing if you are not understanding anything fully, but this post gives good understanding even. Great bpog here! Additionally your site lots up very fast! Providing useful info that helps a Business! It’s in point of fact a nice and helpful piece of information. I’m glad that you shared this useful info with us. it has got wonderful blog posts. Thank you so much for the valuable post.IT is helping me to develop my skill.Google analytics is an important part for every website. It’s an awesome post designed for all the online people; they will get benefit from it I am sure. Yes! Finally someone writes about violinist. No doubt they are. We know several businesses who use them. Lead Forensics and Whosivsiting are also good analytical tools which will track your website visitors. [Here] (https://www.whoisvisiting.com/lead-forensics-alternatives/) Is a really good comparison of the two. We want just a simple counter, readable for everyone. And we want a dialog here. No? I wanna know how many people openned my website? Great help from this blog! Google analytics is a tool used to measure the performance of one’s site. By using it we can see which area we are weak and will be able to find ways to improve its weaknesses. The key to succeeding online is simple; everything you do online has to revolve around your SEO/Marketing Strategy. Great post. 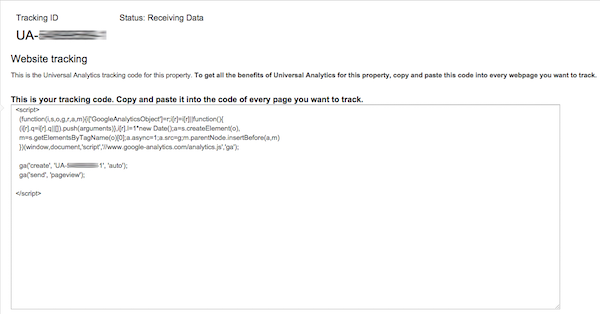 I’d also recommend Google Analytic Counter Tracker Plugin. 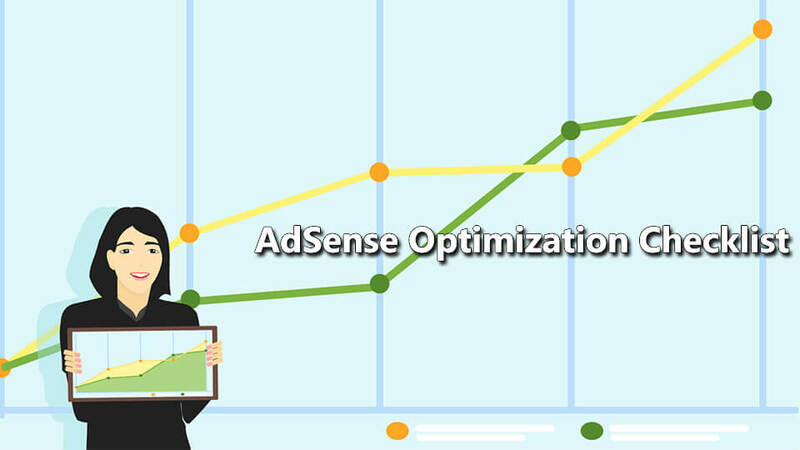 It analyses the visitor hits on your website and show them graphically. It is also easy to use. Is there a way to track past traffic to a webpage? So who visited a webpage i.e. a year ago? Nice post. It is really very helpful for us. I want to ask one more thing. Its about weelytics. As I checked it on betapage.co/startup/weelytics . So will it also be helpful for us to track visitors ..? Thank you for the comment Mercy! A very good post with valuable information. Thanks!